NASCAR driver, Carl Edwards, Jr. is currently a NASCAR Sprint Cup Series and Nationwide Series driver for Roush Fenway Racing. In the Sprint Cup Series, Edwards drives the #99 Ford Fusion which is primarily sponsored by Aflac. His #60 Nationwide Series car, also a Ford Fusion, is sponsored by Scotts-Miracle Gro, Dish Network, Citigroup, vitaminwater, Save-A-Lot Food Stores, and the World Financial Group. In 2005, Carl Edwards became a full-time driver in both the NEXTEL Cup and Busch Series. He has already won races in each, and he made history in the process of winning. On March 19, 2005, Edwards won the Aaron’s 312 at the Atlanta Motor Speedway in Hampton, Georgia, recording his first Busch Series win. PFP Sports & Celebrity Talent Agency is a top booking agent for motivational sports speakers and celebrities. 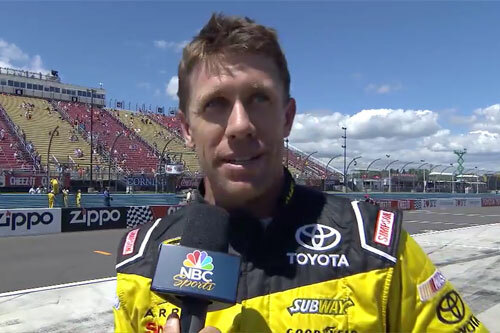 If you would like to book NASCAR stars like Carl Edwards for a speaking engagement, personal appearance or special event, you can request Carl Edwards agent and speaker information from PFP Sports & Celebrity Talent or call 800.966.1380.